The Design phase is the most critical phase of DMADV, as this determines the success of the project. While we arrived at a high-level design in MEASURE phase, we will work on a detailed and complete design in DESIGN phase. Unlike in other phases, where the Six Sigma expert took the lead, the maximum effort in this phase should be from the Process expert. The ownership of creating a detailed design lies with the Process expert(s) because he is the one who can bring out the minute details into the design and also knows the pros and cons of each step, the impact of each factor being introduced, and the quantity and quality of the factors that should be used. Remember, he should not perform this activity alone. There are several Management and statistical tools readily available, along with the support of Six Sigma Expert (Black belt), who will help in using the tools for the best design. These tools are used to achieve multiple results from which an optimized design can be selected based on the statistical inferences available with the design results. Ideally, in any product there are more than several input factors that affect the output variable. The designer needs to know which input variables will impact the quality of desired output when altered even slightly. Alternatively, which variables will impact highly when altered? The designer should also know the values (levels) that these input variables should take, so that the product meets the required qualities (CTQs). Last but not the least; he should also know whether there is any interaction happening between the input variables; this may in fact affect the output variables, even though they are all maintained at the required levels. So, to study the impact of the combined effect, experiments with several combination and levels of variables should to be done. The frequency of repetition of each unique experiment also should be decided. Design of Experiments is a tool that is used for this purpose. The DoE will provide you with important variables, levels of these variables, number of experiments to be conducted and other such details. Imagine a Coffee shop owner, wants to know the best combination of inputs for his Coffee. Input variables are coffee powder, sugar, milk and temperature for boiling. Quantity of each of these items is the levels of variables. To obtain a perfect drink the optimum level of each of these items is required. One can experiment a number of combinations of these three. 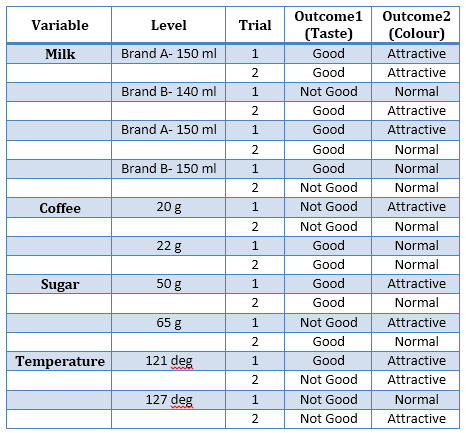 Below is a small table that will provide an idea of the experiments that the coffee shop owner conducts. In business problems, where there are a lot of input variables and the interaction between them is unknown, DoE is definitely a much required tool for designing products and processes. DoE will provide the levels of Coffee, Sugar, milk and temperature which gives the desired outputs. It also identifies if Brand of milk really makes any difference to the coffee made. Simple Linear Progression: In real life, we are not free to use the desired levels of input in any process. There are always constraints which may be introduced by technical, economical, or environmental factors. Given the constraints in performing these operations, the output may not be at its maximum level, but an optimum level. How do we predict/ obtain this optimum level? Simple linear Progression is a tool that helps you in this scenario. Given the constraints (in levels) on all input variables, it helps you in arriving at an output values that are practically possible. Queue management techniques: used to predict the volume at defined intervals; Given a target waiting time, the number of counters that are appropriate for the existing volume, processing time can be determined and types of queue management can also be chosen. Network Optimization: This tool is used by internet service providers to determine the number of towers to be set up and the catchment area for them; Call Taxi providers can also optimize their cab presence and coverage areas with this methodology. These tools are not elaborated in detail here, as this will deviate us from the topic. We have just tried to introduce these concepts to the users, so that they are aware of the tools available for various scenarios. The above methods are helpful in conducting Steps 1-4. After arriving at the design that will meet the customer and business requirements, it is important to fool-proof the system/design. In other words, we should identify the different modes of failure of the product and process, understand the effect and impact of these failures, and fix them. In short, prepare an FMEA (Failure Mode Effect analysis). This would have been discussed in detail in the DMAIC methodology already. Here, FMEA is arrived for the final product and process. If there are any risk areas or failure modes that pose a serious concern, this should be taken care by altering the design or taking some alternative steps. There is no need to say that care should be taken to list down all the failure modes, and their effects. Prevention is better than cure. Having taken such a serious effort to Design a Product/process for Six Sigma, no organization will want to waste their entire effort by overlooking this simple but vital task. Communicating the change in raw material requirements to suppliers. And the list is endless. There is no defined content in the Implementation plan. Organizations decide which is relevant and important for them and thus draw a plan.